We’d love your help. Let us know what’s wrong with this preview of Magic for Liars by Sarah Gailey. Ivy Gamble has never wanted to be magic. She is perfectly happy with her life—she has an almost-sustainable career as a private investigator, and an empty apartment, and a slight drinking problem. It's a great life and she doesn't wish she was like her estranged sister, the magically gifted professor Tabitha. But when Ivy is hired to investigate the gruesome murder of a fac Ivy Gamble has never wanted to be magic. She is perfectly happy with her life—she has an almost-sustainable career as a private investigator, and an empty apartment, and a slight drinking problem. It's a great life and she doesn't wish she was like her estranged sister, the magically gifted professor Tabitha. She doesn't in a Ivy Gamble was born without magic and never wanted it. To ask other readers questions about Magic for Liars, please sign up. Thank you NetGalley and Macmillan/Tor-Forge for this arc. I wish I enjoyed this read more than I did. It sounded like it would be right up my alley. But it just missed out for me. I was so irritated with Ivy's self pity through out the book, that I was tempted to give up by 37%. I found it to be a slow read as it lacked the tension I usually find in murder mysteries and I had a tough time connecting to any of the characters. There was plenty of teenage angst and drama (as expected for a story set Thank you NetGalley and Macmillan/Tor-Forge for this arc. I wish I enjoyed this read more than I did. It sounded like it would be right up my alley. But it just missed out for me. I was so irritated with Ivy's self pity through out the book, that I was tempted to give up by 37%. I found it to be a slow read as it lacked the tension I usually find in murder mysteries and I had a tough time connecting to any of the characters. There was plenty of teenage angst and drama (as expected for a story set in a high school), but the "magic" didn't really sparkle for me. This book was a fun, interesting read, and a book that managed to successfully combine multiple interests of mine into a coherent narrative! Ivy Gamble is a messy protagonist, which might put some readers off but made me like and understand her. She has a lot of problems she hasn't dealt with, her life never went according to plan, and now she's being asked to investigate a murder at a magical academy--the same academy where her gifted twin Tabitha teaches. And it Thanks to Netgalley for the ARC! Ivy Gamble is a messy protagonist, which might put some readers off but made me like and understand her. She has a lot of problems she hasn't dealt with, her life never went according to plan, and now she's being asked to investigate a murder at a magical academy--the same academy where her gifted twin Tabitha teaches. And it only gets more interesting from there. I loved this book. I love the premise, I love the mystery, I love the twist at the end, this book is great. Good for mystery lovers, good for fantasy lovers, good for people who enjoy a story you just can't put down. Magic for Liars has everything; murder, romance, teen drama, sisterly bonding, trauma healing, everything. Can't recommend this enough. A thrilling, thoughtful, funny, cutting, and heartbreaking mystery. Like Harry Potter meets Mean Girls by way of Broadchurch. Whodunit meets the Magicians by way of gritty noir and Jodi Picoult. A huge pleasure--effortless character building and a very believable world. This one's going to blow up! I have mixed feelings about this one. I decided to give it a shot despite not being into murder mysteries because it sounded super interesting (a non magical private investigator is asked to solve the murder of a teacher at the magical academy where her estranged sister works), and there are a lot of things I really liked about it. The setup is great, obviously, and the writing is top notch. It's snappy and well-crafted, really giving a nice feel to this P.I. story without ever going too ham on i I have mixed feelings about this one. I decided to give it a shot despite not being into murder mysteries because it sounded super interesting (a non magical private investigator is asked to solve the murder of a teacher at the magical academy where her estranged sister works), and there are a lot of things I really liked about it. Across the bay, San Francisco bled money like an unzipped artery. Those who had been privileged enough to have their buckets out to catch the spray drove back over the water to Oakland-- from The City to The Town. They bumped aside people who had been living in these neighborhoods for generations, and they tore down storefronts, and they built brunch pubs with wood reclaimed from the houses they were remodeling. The character development for the main character, Ivy, is also so clear and fleshed out that it gave me all sorts of feelings. The problem? Those feelings were not always good in the later stages of the book. She starts out so sympathetic! I wanted good things for this stunted woman who was having to face this world that she had never been, and would never be, a part of. Her defensive reactions to this pain, to the mages' total and utter indifference toward her, are just so spot-on. But at a certain point she starts letting her desperate desire to belong drive her into making some really awful decisions. Just really unwise, y'all. She goes from being believably sad sack but still smart, to being honestly kind of pathetic. The closest real-world example I can come up with is like when that popular person who bullied you in high school tries to friend you years later on Facebook, but instead of gleefully (or indifferently) denying the request, Ivy is that person who's flattered and validated and starts spinning fairytales about how they're going to be best friends. And we're talking about a woman in her mid thirties here. I also had some issues with the mystery being too simple, with several of the pivotal clues just being stumbled upon. I admittedly don't know the genre well, but this seems... not ideal. The romance also felt very out of place (although the love interest was a total peach), and there were ideas I wanted to see explored that were just dropped (consent!!). I had to think about the main thing that bugged me overall and I think it's this: the book was determined to stay lighthearted even though there are some big, deep ideas that I personally feel should have been treated with more gravitas. There are some pretty dark implications to some of the magic that the author shies away from exploring, and I feel that the actions of the characters are treated too lightly. I ended the book feeling like, "No, this person can't just go on with their life!" "No, that person can't just have that relationship back after what they did!" There are characters that are just going to call it a day and be able to sleep at night, and I hate it. Murder mystery at magic school. High school clique drama. Engrossing noir detective inner monologues. Tough as nails detective. Twins reuniting from an estranged relationship. Secrets around every corner. If any or all these thoughts entice you, you’ll enjoy this debut by Sarah Gailey. Written with balance and humor, Gailey writes in a believable manner that keeps you wanting more. She opens it with a traditional scene of a gruesome murder and then develops the main character with ease. Using tr Murder mystery at magic school. High school clique drama. Engrossing noir detective inner monologues. Tough as nails detective. Twins reuniting from an estranged relationship. Secrets around every corner. If any or all these thoughts entice you, you’ll enjoy this debut by Sarah Gailey. Written with balance and humor, Gailey writes in a believable manner that keeps you wanting more. She opens it with a traditional scene of a gruesome murder and then develops the main character with ease. Using traditional noir formulas and tropes, she writes this very unique tale that will please anyone whose a fan of the urban fantasy genre and authors like Jim Butcher. Needless to say, it is a page turner with surprises that will not disappoint. This book is seriously so good. Ivy is an amazing protagonist. Her emotions are so real and relatable. Her relationship with her sister and to this world of magic she isn't a part of are extremely compelling, as is the system of magic that Gailey has created. I'm fascinated by this world and I would love a whole detective series starring Ivy solving crimes in the mage community. Bonus points for a cute, realistic romance subplot. I want to be friends with Sarah Gailey. I love the way they view the world. From alternate history featuring heists and hippos to a new take on the "chosen one" trope that turns all detective tropes on various heads and asses: I am there for all of it. Ivy Gamble is a hard-drinking, no-qualms private investigator from the gritty part of town. She is approached by the headmaster of an elite magic academy to investigate the death of one of the teachers there (who was found, you know, in the Theoret I want to be friends with Sarah Gailey. Ivy Gamble is a hard-drinking, no-qualms private investigator from the gritty part of town. She is approached by the headmaster of an elite magic academy to investigate the death of one of the teachers there (who was found, you know, in the Theoretical Magic section of the library, um, SPLIT IN HALF). Ivy is hesitant to take the case, as it presses on old wounds: another teacher at the school is her long-estranged twin sister, who is the one of the family who has magic. Ivy herself never manifested magical ability, and has tried her whole life not to be bitter about it (with varying degrees of success). However, this is the chance to take on a real murder case, and the detective in Ivy is just too curious (and slightly self-destructive) to pass up the opportunity. What follows is an intriguing examination of the similarities and differences between magical and nonmagical teenagers, schools, and lifestyles. Ivy finds herself comparing the Ivy-that-is both to the Ivy-that-was and the Ivy-that-could-have-been, alongside her mind's inevitable comparisons to her sister. She has a chance to see what she has believed her whole life that she is missing, and whether that is actually better, easier, or in a neater package. And, you know, a violent murder to investigate. And various degrees of snarky, magical teenagers, one of whom may or may not be a Chosen One. And conspiracies. And magical theories. and nonmagical theories. And lots and lots of booze. I enjoyed this female-driven dive into urban fantasy detective noir. The mystery plot, to me, wasn't terribly complicated, but I enjoyed and was intrigued by the journey. I found the magical system and the way the magical world was set alongside our own fascinating. I related a lot to Ivy, with the interplay between how she once wanted her life to go and whether or not she was content with how she found her life to be, her blindspots (which I won't go into because many of the reasons I love her are somewhat spoiler-y), her penchant to drink too much wine, her desire to have books whisper to her, and her bravery in picking herself back up after every tumble. A fun read that, while not perfect or especially convoluted, nevertheless proved to be both enjoyable and thought-provoking. I am so excited for everyone to read this, wow wow wow wow wow. Every reader I have ever been, from the 12-year-old whose favorite writer was Raymond Chandler to the tired lady who tries hard every day, loves everything about this book. Incisive on so many levels and a sheer joy to read. Really good in unexpected ways - this isn’t so much a fantasy novel as it is a detective novel that tackles identity issues and has magic in it. This book presents as (urban fantasy) noir: a private investigator, who drinks too much to cope with her loneliness and alienation, is given the opportunity to move up from adulterous spouses and work on an actual murder mystery, at the magical school where her estranged twin sister teaches. She insists she's fine with the fact that her sister has magic and she doesn't. I spent some of the time nearly believing her, and I think she spent some of the time nearly believing herself. She's a deeply This book presents as (urban fantasy) noir: a private investigator, who drinks too much to cope with her loneliness and alienation, is given the opportunity to move up from adulterous spouses and work on an actual murder mystery, at the magical school where her estranged twin sister teaches. She insists she's fine with the fact that her sister has magic and she doesn't. I spent some of the time nearly believing her, and I think she spent some of the time nearly believing herself. She's a deeply flawed and broken person who I absolutely wanted to succeed, even though that seemed highly unlikely. There's some more tragic backstory of the kind that could happen in almost any family, which only makes it more effective; and there's a doomed romance with one of the other teachers. Doomed, because the PI tells herself that, for the sake of the investigation, she has to not reveal the fact that she has no magic... hence, I assume, the title, Magic for Liars. It pulls off the feat of being adjacent to a classic YA story - there's a prophecy about a Chosen One, and all kinds of teen magic-school drama and angst - without that story taking over, or even being taken all that seriously most of the time. There are some beautifully crafted phrases, like "It was like stealing candy from a big bowl of free candy surrounded by helpful multilingual signposts," or "the bags under my eyes were definitely well past the carry-on limit". There are herrings of a deep red hue (which had me completely fooled); terrible and wonderful moments of powerful magic; deliberately incomprehensible jargon that the PI pretends to understand, and that imply a complex and deep magical world; poignant interpersonal and intrapersonal moments; and an ending that, somewhat contrary to the noir tradition, holds out some hope (without revealing the outcome of the hope one way or the other). It's powerful, and expertly done, which is why I bumped it up to five stars. It isn't the kind of book that naturally leads to a sequel, but I would certainly read another book by this author, especially if it took place in the same world. The one significant criticism I have is that the pattern of "reluctant witness is about to finally give the PI a clue, someone interrupts" happens a bit too often. 4.5 stars– I’d read this one described as “Tana French meet The Magicians”– and well, I’ve never read The Magicians, but swap that out for a grittier, Americanized, post-Harry Hogwartsian murder mystery, you’ve got a pretty good idea of what to expect with this book. Somehow, Sarah Gailey manages to build an entirely believable, magical world all the while hooking you into a grisly schoolyard murder. Peppered with compelling backstories, family dynamics, a slightly-unlikeable-but-root-worthy pro 4.5 stars– I’d read this one described as “Tana French meet The Magicians”– and well, I’ve never read The Magicians, but swap that out for a grittier, Americanized, post-Harry Hogwartsian murder mystery, you’ve got a pretty good idea of what to expect with this book. Somehow, Sarah Gailey manages to build an entirely believable, magical world all the while hooking you into a grisly schoolyard murder. Peppered with compelling backstories, family dynamics, a slightly-unlikeable-but-root-worthy protagonist, and I was all in. I read this whole book in one 7-hour burst!! It was so good. This is a great magic school murder mystery. Similar to The Magicians, but told from a detective’s perspective. It's got a bitterness to it; it's dark and smart and full of magical suspense -- but it's still full of wonder. I loved Ivy's voice, completely and utterly okay with her sister Tabitha being magical, and also just such a liar, to herself and to everyone around her - sometimes for the job, sometimes for her own (questionable) well-being. I loved the mystery and the twist and the oh-so-privileged young mages who are even scarier than normal teenagers. I loved the magical theory I loved this book! I loved the mystery and the twist and the oh-so-privileged young mages who are even scarier than normal teenagers. I loved the magical theory and the very very horrendous and fascinating method of magical surgery that appears in the book! One of those books where finishing it feels like coming up for air, because the world & the characters pull you in so much, and it's all fascinating & the book is really good but something about it is strange in a way that it's maybe a little bit suffocating. You know? Magic for Liars is Sarah Gailey’s answer to detective noir, murder mysteries, and magical schools, and from the moment I heard of it, it’s been one of my most anticipated books of the year. 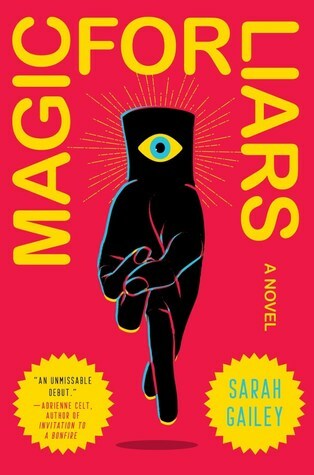 In anticipation, I’ve spent this year reading all of Gailey’s work that I could get my hands on and, much like their short fiction and novellas, Magic for Liars is cleverly written, darkly humorous, brilliantly insightful, and impossible to put down. Gailey casts their own spell with the premise alone: privat Magic for Liars is Sarah Gailey’s answer to detective noir, murder mysteries, and magical schools, and from the moment I heard of it, it’s been one of my most anticipated books of the year. In anticipation, I’ve spent this year reading all of Gailey’s work that I could get my hands on and, much like their short fiction and novellas, Magic for Liars is cleverly written, darkly humorous, brilliantly insightful, and impossible to put down. Gailey casts their own spell with the premise alone: private investigator Ivy Gamble gets asked to solve a gruesome murder at Osthorne Academy of Young Mages, where her estranged and magically gifted twin sister Tabitha teaches. From the moment Ivy takes the case, the story spirals into a character-driven exploration of nuanced sibling relationships, the pressures and expectations of magic, realistic high school drama, and how to heal from and process the difficulties, choices, and traumas of life—magical or otherwise. The narrative carried a heartbreaking emotional weight that I wasn’t always prepared for and yet, at the same time, this was the most fun I’ve had reading a novel this year. This book takes an obscene amount of my interests and manages to combine them into a beautiful, coherent narrative that feels like it shouldn’t work—but it does. I left this book longing to return to the magic and secrets of Osthorne, despite everything I’d seen, and I’m confident that any reader who picks this up will find something to love about it. I’m already eagerly awaiting whatever Gailey decides to write next and when Magic for Liars releases in June, I’ll already be shoving it into the hands of everyone I know. I'm typically not a noir (or murder) fan, but the magic element got me a little intrigued, so I decided to give this a try. Got pleasantly transported to a magical high school, with some fun twists and turns and some really wonderful weirdness. The magic in this story is subdued, focusing more on the mystery and relationships, but the magic that was present was weirdrously imaginative. Gailey's got a funky, descriptive angle on the magical realm and hey girl honestly if you're reading this can we I'm typically not a noir (or murder) fan, but the magic element got me a little intrigued, so I decided to give this a try. Got pleasantly transported to a magical high school, with some fun twists and turns and some really wonderful weirdness. The magic in this story is subdued, focusing more on the mystery and relationships, but the magic that was present was weirdrously imaginative. Gailey's got a funky, descriptive angle on the magical realm and hey girl honestly if you're reading this can we just grab coffee and hang out because anybody who can create this world seems super rad, y'know? Also, the strained sister relationship - god, I'm a sucker for this. I have a sister and I love her and I always wish we were closer and I'm always happy when we connect, and those moments feel too rare and spark a yearning ache in the center of my chest when they happen and this book captured that complicated sister relationship perfectly. Love the cover, loved the book, give it a try, end scene. I really liked this one. Ivy Gamble is a PI who has no magical abilities, unlike her estranged twin Tabitha. When there's a murder at the (magic) school Tabitha teaches at, Ivy is hired to investigate, and she has to confront her feelings of inadequacy and grief over the way her life has gone. I liked Ivy - she's really relatable - and both the mystery and the setting are nicely developed. Mrs Webb, the school secretary, in particular, is fascinating, and I liked the way the students and teacher I really liked this one. Ivy Gamble is a PI who has no magical abilities, unlike her estranged twin Tabitha. When there's a murder at the (magic) school Tabitha teaches at, Ivy is hired to investigate, and she has to confront her feelings of inadequacy and grief over the way her life has gone. I liked Ivy - she's really relatable - and both the mystery and the setting are nicely developed. Mrs Webb, the school secretary, in particular, is fascinating, and I liked the way the students and teachers try to manipulate Ivy. It can be hard for her to tell what's magic and what isn't. I did wish for a little more from the book - it would have been nice to get a little better feel for the victim, and I thought that the murderer was fairly obvious about three quarters through the book and the ending felt a little rushed. That being said, this was a great read and I recommend it. Magic for Liars was a fun read, complete with a protagonist, Ivy, who is a hot mess and has to investigate a brutal murder at the exclusive school for magic where her estranged twin sister works. I enjoyed the world that Gailey created and how she merged magic into the everyday world and even explained how it worked. I also loved how the teenagers were teenagers, despite their magical ability. Her writing is lovely and is full of vivid descriptions. Ivy is a great character — fallible, self doubti Magic for Liars was a fun read, complete with a protagonist, Ivy, who is a hot mess and has to investigate a brutal murder at the exclusive school for magic where her estranged twin sister works. Ivy is a great character — fallible, self doubting, messy, drinks too much, yet smart in her own way. It is interesting to watch her navigate this strange world of magic as an outsider, as the reader is, and try to solve the murder. I did feel like it all ended very quickly, like there was something more that would have brought us to the ending in a more satisfying way, though I did enjoy the twist at the end. I wanted to like this SO much. I loved the American Hippo books. The concept for this was exceptional. And it was touted as being a cross between The Magicians and Tana French. Unfortunately, the book failed to live up to the premise it set up. While it simmered with potential almost right up to the end, the story often felt flat, the plot had a lot of threads that never quite knit together properly, and worst of all, the "solve" was a complete cop-out (and an overu 2.5 disappointment-laden stars. Unfortunately, the book failed to live up to the premise it set up. While it simmered with potential almost right up to the end, the story often felt flat, the plot had a lot of threads that never quite knit together properly, and worst of all, the "solve" was a complete cop-out (and an overused one) that feels cowardly every time a mystery writer uses it to explain a murder. Also, the whole book is just utterly depressing. I can see the Tana French comparison to an extent, but this book has zero in common with The Magicians, so look elsewhere if you're seeking your next Brakebills-like fix. Gailey writes well and she had a GREAT idea for this story, but the execution was such a disappointment.